Juki MO-50en Serger with Big Bonus Bundle $349.00 - FREE SHIPPING! 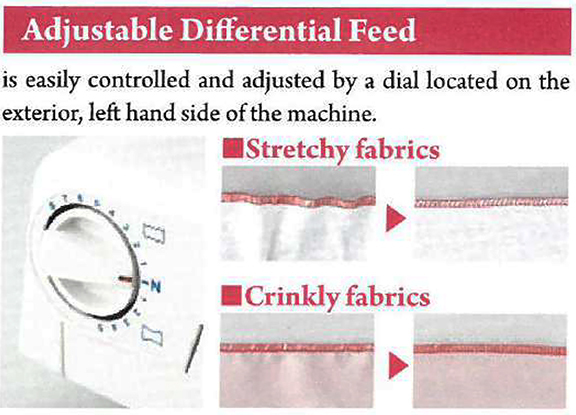 A serger designed for the home hobby sewist, the Juki MO-50en offers serging simplicity at an affordable price. This powerful yet compact machine has features found on models many times its price, providing great value and versatility. Great for those just beginning with sergers, the MO-50en will not disappoint! The Juki MO-50en is a 2 needle, 3/4 thread serger and overlock machine that offers the basics and more. 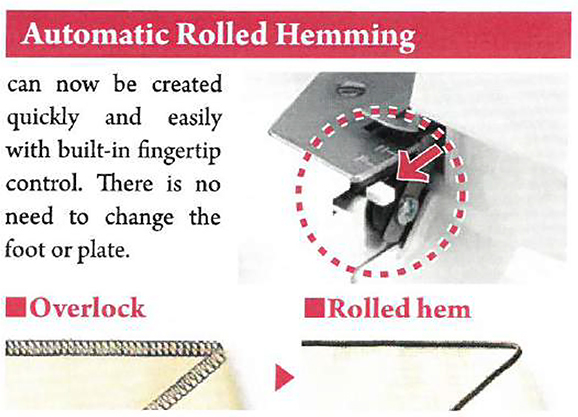 This reasonably-priced, easy to use machine can be used for a variety of overlock, rolled hem, and flatlock stitches using 3 or 4 threads. It has an adjustable differential feed for even stitching on a variety of fabrics including stretchy knits and adjustable stitch length. Differential feed, stitch length, and the lower knife blade are all adjusted with easy dials. 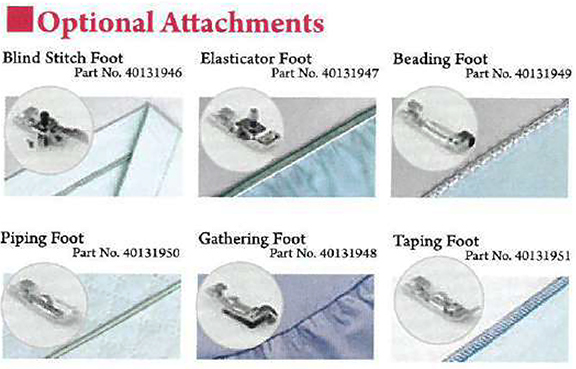 It creates professional looking seams and hems at 1,300 SPM. Speaking of great features, the MO-50en has easy lay-in thread tension slots and an automatic lower looper threader that threads the machine at the push of a button. 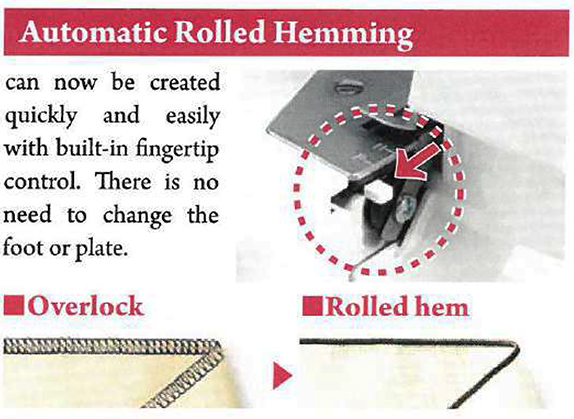 It also does automatic rolled hemming without the need to change presser feet by simply activating a control button. The upper knife is retractable and the lower knife adjustable, so there is total control over the width of the seam allowance. Additionally, the MO-50en has a cool, but very bright LED light that illuminates the whole needle area for easy viewing. The light has its own on/off switch. The machine uses snap-on presser feet and has a foot lifting handle and built-in thread chain cutter. There is also a convenient waste collection bin that catches fabric and thread trimmings to keep things neat while the machine is in use. The Juki MO-50en weighs approximately 16 lbs and sits stable while in use. It comes with a starter set of needles, a spare upper knife blade, a net, spool caps, machine cleaning tools, and more. The big bonus bundle adds even more value with 12 cones of Maxi-Lock serger thread in white, black, and eggshell, 50 Organ size 14 needles, a set of 6 specialty presser feet, and a fabric machine tote (color may vary), to take the MO-50en anywhere. The Juki MO-50en serger is protected by Juki’s 2-year warranty on motors and specific electronic parts and 5-year warranty on mechanical parts minus exclusions. There is also a 90-day warranty on labor and adjustments. This warranty applies only to personal machines and is voided by commercial use. The Juki MO-50en Personal Serger - Pro Model Features At An Affordable Price!